Tezashi means hand stitch and mishin means (sewing) machine stitch. 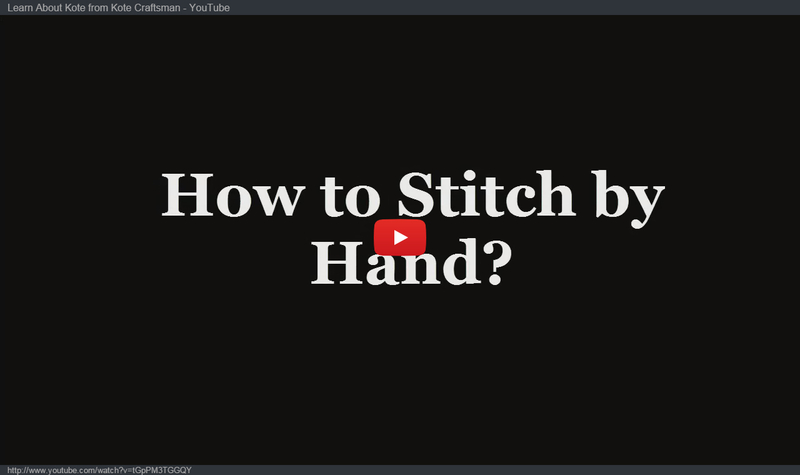 What part of the stitch are we talking about? First of all, this is a kote padding (picture above). 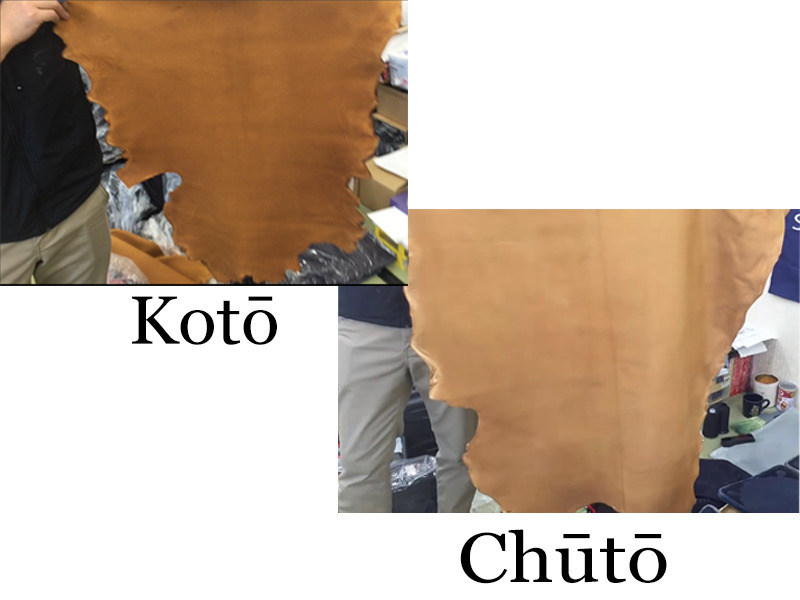 In the kendo world, it is called kote-buton, the futon of kote. Why is it “b” instead of ‘f”? Please refer to rendaku in Wkikipedia. And a men padding is called men-buton. A Reason to Put Stitches In? Futon is the padding to protect our head and forearms. That is why the futon itself is very thick as seen in the picture above. It looks thick enough for me but it would hurt us a lot without stiches. The reason they have stitches on the padding or futon is that to absorb more impact to keep us from the pain. Why is Tezashi Better than Michin Zashi? The top row is tezashi and the bottom one is mishin zashi. Can you see the differences? The stitches are dots in the tezashi whereas the machine ones are lines. 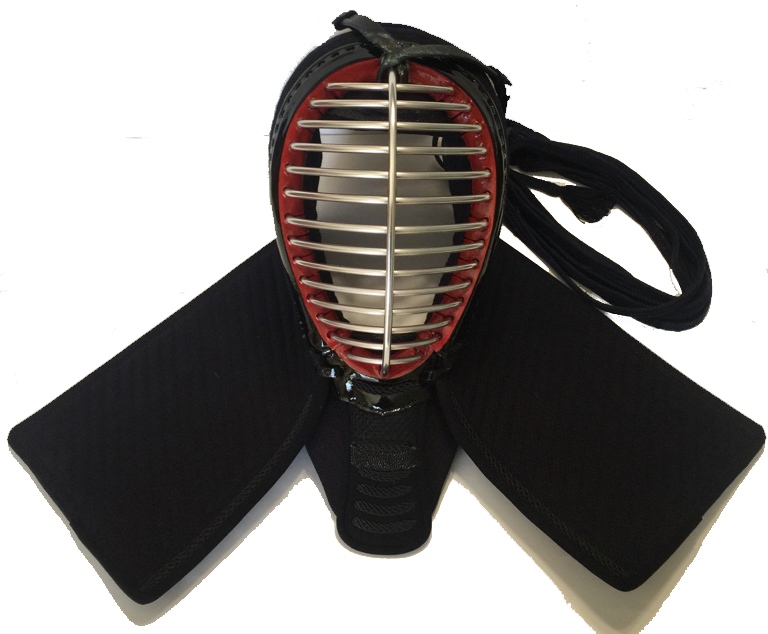 The bumps are created sideways in machine stitching but the teazashi makes bumps all over the kote thus it absorbs more impact. So less pain! 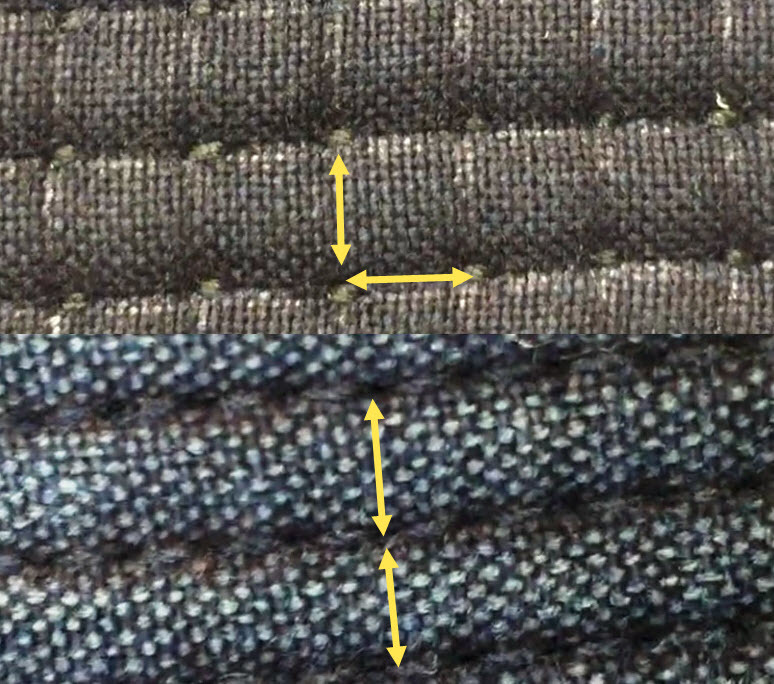 In tezashi, the spacing between stitches are the same length all the directions. But due to the way the sewing machine works, the spacing can be between lines. Please see the picture. However, more bumps do not necessarily mean more impact will be absorbed. Kote specialists recommend 2bu zashi (2bu is about 6.06mm (≒0.24inch). That indicates spacing between stiches. If you have more bumps that means more stitches. This means that stitches squashes the futon more. That means futon becomes thinner and tougher. If the futon becomes thinner and tougher, it won’t absorb impact. It looks more beautiful if the futon has more stitches. 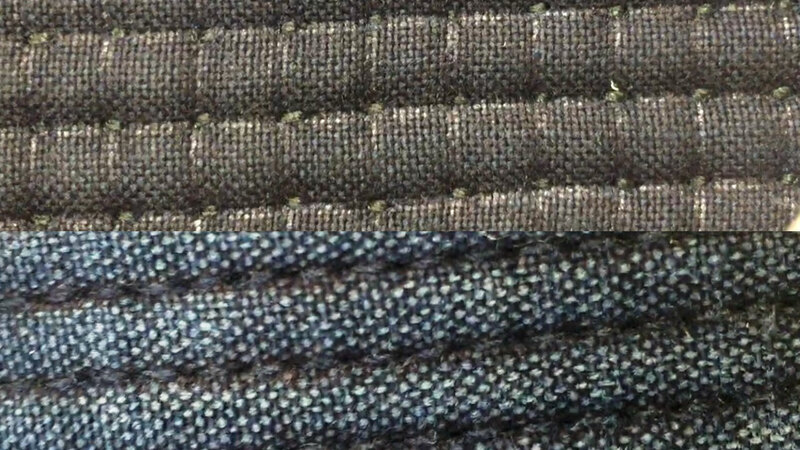 So you should know why you are ordering bogu with certain stitch space. According to the video, The Making on Youtube, one men padding has 8,000 to 12,000 stitches and the process takes 7 to 10 days. Why? It is because they do it by hand! The kote craftsman demonstrated how the tezashi stitch is done. Please play the video below. You can watch how the tezashi is done. The demonstration was done using a thin tenouchi leather piece and also just a few stitches. 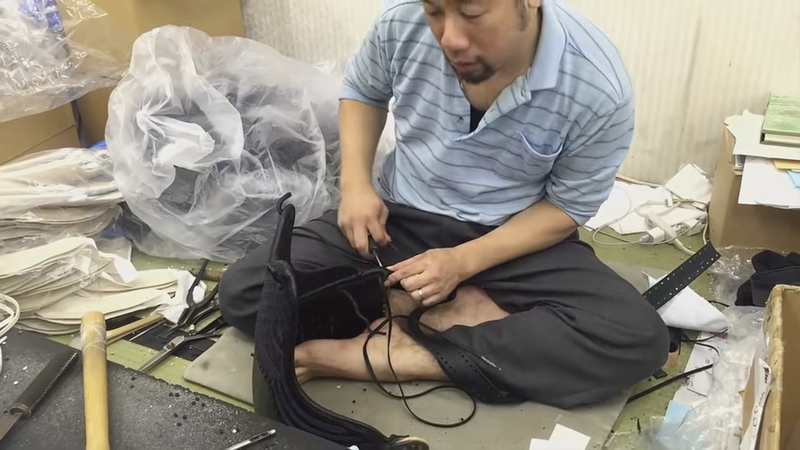 If you carefully watch the specialist sewing futon, you will be amazed. The futon itself is really thick. The specialist pushes a needle in and pulls it out at the correct spot. They do this for 7 to 10 days. A specialist sews your futon one stitch at a time making sure it has correct spacing and looking beautiful. No wonder why most of the kendoka always want to have tezashi and custom and handmade kote, right? Once you know how good handmade is, you cannot return to the machine made.